The Gran Fiesta Tour Starring the Three Caballeros is our choice for #Day28 in our #DisneyWorldCountdown! Hello everyone, and welcome to #Day28 in our #DisneyWorldCountdown! We are exactly 4 weeks from when we check into our resort at Bay Lake Tower, and the time will be by before you know it! 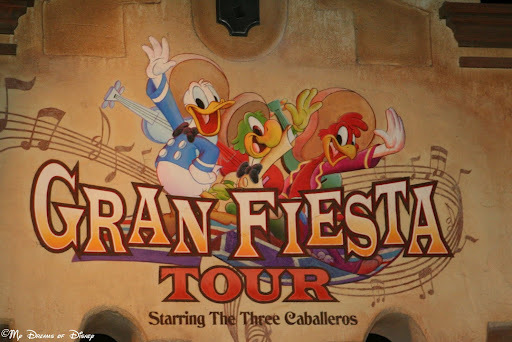 For today, we are taking a look at the Gran Fiesta Tour Starring The Three Caballeros! This is one of my (and Sophie’s too) favorite attractions, and can be found in the Epcot World Showcase Mexico pavilion! The Gran Fiesta Tour is a similar ride structure to it’s a small world, but it focuses on José Carioca and Panchito Pistoles and their search for Donald Duck, who has gone missing — and he could be somewhere anywhere in Mexico! Along the way, it becomes pretty obvious to this writer that when you find Donald Duck, you’ll find him somewhere in the company of a striking lady! I really enjoy riding this attraction, and it’s a big winner in my book because it never has a long line! So tell me, what do you think of this attraction? Ride it, skip it, or something else? Let me know in the comments below, and thanks!